I wrote this article nearly four years ago in April 2010, just before hell broke loose a few weeks later when the red shirt protests ended bloodily with the brutal military crackdowns that left over 90 dead and nearly 2,000 injured. At the time of the original article, negotiation failed and the hatred and vile rhetoric was reaching its peak. We’re now seeing another spike of hate speech in Thai politics, which is very worrying. The original article got circulated once again some days ago and caught the attention of the Bangkok Post, which asked to publish a somewhat shortened version of it on February 4 (here). A different group of protesters is on the street now in a different psychotic episode in the prolonged dramatic saga. Different episode played from a different script but still essentially the same Thai case of Dr. Jekyll and Mr. Hyde. Disdain. Disgust. Vitriol. Violence. Hatred. Suspicion. Ill will. Paranoia. These are what fill the air and are spreading like viruses in Thailand at the moment. It’s not a normal time for the Land of Smiles. What a misnomer now: “Land of Smiles”. It feels more like “Land of Hate”. To my great distress, many Thais have turned into the most rabid hate and fear mongers, a fact anyone who’s followed Thai politics in the past few weeks cannot have missed. The transformation of the Thai national character from a gentle and friendly people to a tribe of venomous and bloodthirsty misanthropes was so swift and drastic as to stagger even the most sober person. Do we have a case of a Thai Dr Jekyll and Mr Hyde here? I believe we do. First, let’s have a look at the Thai Dr Jekyll — the polite, personable, sociable and hospitable Thai that you have always known (or thought you knew), who is quick to smile, takes things easy (sometimes too easy), avoids conflicts like the plague and always knows how to have fun. Thais are a “peace-loving people”, most Thais believe. This “peace-loving” characteristic may not bear up on close scrutiny, given that we have also been taught the glory of wars in which Thais bravely fought and killed our enemies — many times. But that doesn’t really matter because we’ve never really felt the need to scrutinise our past. It is also convenient that the most disagreeable episodes in our history, such as ones where Thais have killed each other, are normally left out of schoolrooms and social discourse. In all school and social activities, every Thai learns the concept of harmony (samakkhi). Whatever happens, we are taught that we are family, “brothers and sisters” and we need to find ways to agree, “give and take and compromise”. Harmony in society is of the utmost importance and a foremost virtue to keep and protect for the sake of our “Nation, Religion and King” — the three key pillars of our society and the testament to what it means to be Thai and what it means to belong. These ideals have made an indelible imprint on our psyche. But what’s just happened evidently shows that the good Dr Jekyll of Thailand has suffered a serious psychotic breakdown. The terror of Mr Hyde lies not only in his capacity for violence, but also because he is guided solely by primal instinct. Unburdened by any code of morality, his actions are hence unrestrained. These days I often shudder when I read and hear things uttered by my fellow Thais. Many Thais are no longer relating to each other as humans, but as animals and monsters: stupid “buffalos” (kwai) and nasty “lizards” (hia) rank among the top. Many polite Thais now use the most vulgar forms of address with one another, though still largely behind keyboards. It seems more Thais now have very little respect for each other as human beings, if they don’t wear the same political coloured shirts. Those who resist one colour or another, or try to talk principles rather than ride on the psychotic tides, are deemed suspicious. “Us or them” is the reigning mentality. If you agree with them, you are a “true” Thai. If you don’t, you are suspected as a “fake” Thai or “fake” something or of hiding your true colours. I have seen some nice, gentle school friends turn into hideous and vicious creatures who spew out hate and vulgarity and clamour for death and destruction of “the enemies” who wear different coloured shirts. How much more simplistic can it get? Hating others based on their shirt colour? Wishing them dead because of their shirt colour, because they are “stupid”, because they love someone you hate, or because they are suspected to hate someone you love? Is the psychosis that unleashed the evil Mr Hyde as simplistic as this? Or is it possibly rooted in something a little more complex? Obviously “Thai harmony” has broken down. Thais now question the national loyalty of others who have different views from their own. The epithet “Are you f**king Thai?” is hurled freely. Different viewpoints are considered disagreements that are taken personally. The subsequent attacks are hence also personal, unrestrained, juvenile, even childish in nature. Those who disagree are suddenly “traitors” of the nation. How can a society that extols harmony and unity be so intolerant and vicious towards its own? I see a culprit in Thai education and socialisation. 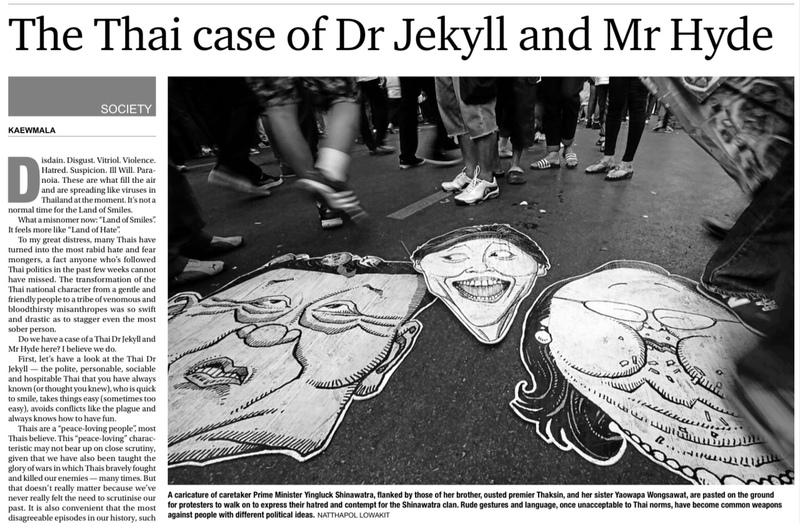 In other words, Thai society has created its own monster; it has nurtured its own Mr Hyde. By extolling unity and harmony at the expense of other no less lofty values, in particular the pursuit of knowledge and truth, Thais have learned to abhor differences in thought or any diversity in behaviour and identity because, I believe, Thais have mistaken uniformity for harmony. We Thais have not been taught to value the pursuit of knowledge and truth through independent learning and open discussion with those with differing viewpoints. ”Truth” in Thai society is often something that has been agreed upon (those in power get to agree of course, and those not in power get to accept the agreement and the truth). “Truth” in the Thai concept is not something unalterable that is based on facts and supported by logical reasoning. Because serious thoughts and analyses are usually not required for success in Thai society, many Thais have not had enough practice in serious thinking. On the other hand, many anti-red shirts are simply uninterested in knowing if the red shirts might have real grievances because they have already prejudged them as having only one motive: to reinstate the square-faced devil. The majority of Thais have a conspicuous lack of interest in listening to or finding out what the protesters want because of this prejudgement, as well as the common lack of interest or capacity to seek the truth. Thais have never been taught to enjoy vigorous debates because they are too uncomfortable about confrontation, and do not want to disrupt the jealousy guarded harmony. We are not encouraged to sort through our differences with reason and principles but through agreement and compromise. So when agreement and compromise are not possible, we go haywire. We are unable to deal with conflicts in any other way and so resort to the only other means available: primal emotions or faith. I’m not saying there are no Thais with intellectual maturity who can rise above primal instinct and programmed thoughts. There are many, but there are not enough of them to withstand the overwhelming tide of raw emotion and lack of reason. The fact that Thai society has long been closely attached to militarism, means that Thais have also learned to view uniformity and order as desirable, and harsh discipline for any divergence as appropriate. We Thais also have a strong tribal mentality — we love those of our own and hate those that don’t belong. We have a great capacity to love and to hate intensely and irrationally. It doesn’t sound very modern or very attractive, but let’s face it, that’s what we are: Dr Jekyll and Mr Hyde. Will Dr Jekyll recover and find the right potion needed that puts an end to Mr Hyde? I believe eventually he probably will, but perhaps not before Mr Hyde has had a chance to wreak more havoc. But more importantly, will Dr Jekyll learn a lesson and find a way to deal with his inner demon? Will he ever learn that there is good and evil in all of us, that nobody is all good or all evil, and that the key to survival is to come to terms with one’s real self? The original version of the article was published on this blog on April 27, 2010, here. Thanks for revisiting and reviving your 2010 article Kaewmala. It is most relevant. The art of compromise is necessary in politics… and I hope rationale voices from all sides can sit down and find solutions. True then, true now. For those of us trying to comprehend what currently roils Thai society your comments are extremely helpful. Please give us more.